- The Earth's outer core is a liquid layer about 2,266 km thick! - The outer core is made of iron and nickel. - Sulphur and oxygen could possibly be found in as well. 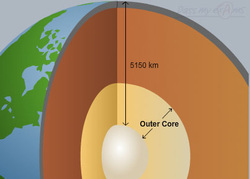 - The outer core is the layer that lies above the solid inner core and below the mantle. - The temperature of the outer core ranges from 4,100 °C in the outer regions to 6,100 °C near the inner core.